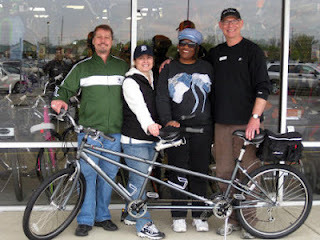 Century Cycles Blog: How far would you drive to get a bike? 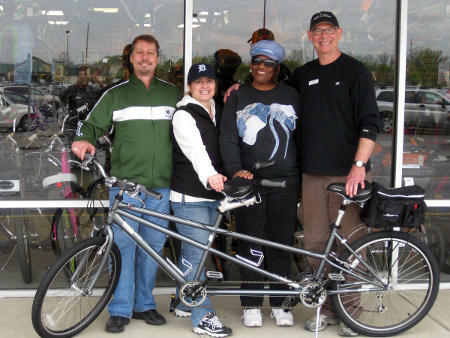 Our customer Judy Dawson came all the way from Detroit because a web search convinced her that Century Cycles in Medina is one great place to test ride and buy a tandem bicycle. Judy has no sight, but she has contagious energy and enthusiasm for all things in life. Her can-do attitude makes riding on the back of a tandem a piece of cake! Judy is pictured above with her friends David and Amy, as well as Medina manager Mike Petcher. The trio also snuck in a visit to relatives and a local music store, which meant that Judy headed home with a saxophone AND a Raleigh Companion. Judy--you go, girl!